It may be a cliché to open a blog post with a quotation, but in the world of modern marketing today these words ring truer than ever. To drive growth using pipeline marketing, you must be able to provide clear attribution to both tactics and channels to determine what is working and what is not. In today's post we're going to dive into a few key reports and HubSpot reporting hacks that we use to measure and report on the effectiveness of our marketing efforts and integrate sales and marketing. 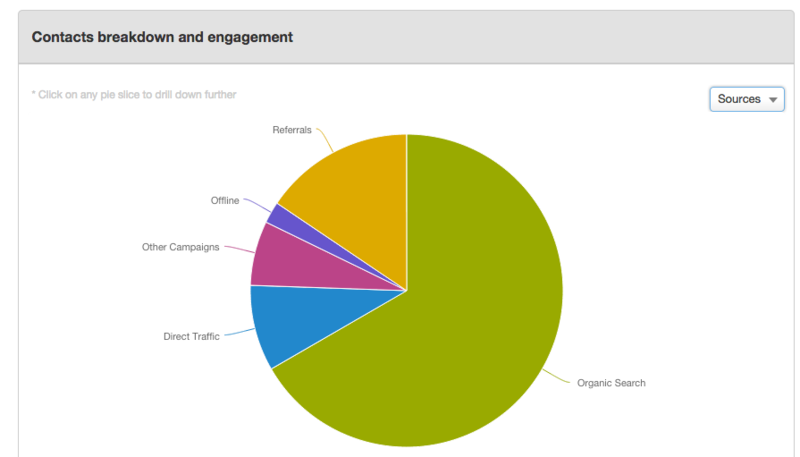 Note: HubSpot enterprise subscriptions definitely have much more reporting functionality. I'll start with some professional-level tactics and then include some enterprise reports at the end. 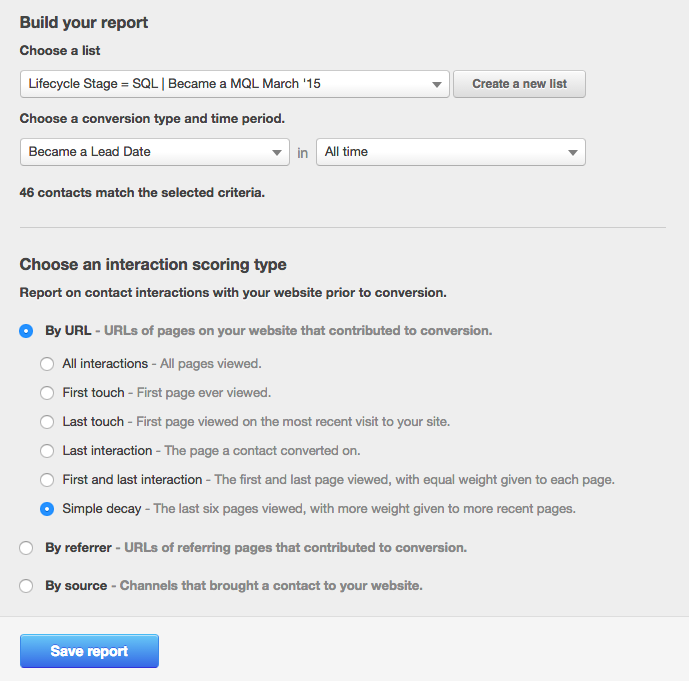 Once the list has been populated, you can then use the list reporting feature to view both the lifecycle stage and source for these new blog contacts. Above you can see an example of the list source report. This should give you some more insight into what sections of your website are attributing to first touch and how the contacts that are viewing these pages first are moving through the funnel. Unfortunately in the pro level, if you want to look at a certain subfolder of the site, you do have to export this to Excel and run the pivots. With enterprise-level HubSpot portals, you can run multitouch attribution models across a range of criteria, from all interactions to a simple decay of the last six pages viewed. 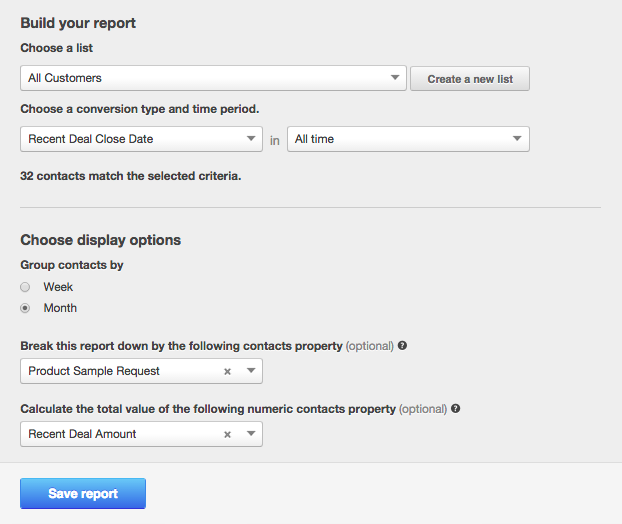 You can even select specific lists on which to run these reports, and as HubSpot Product Manager Rachel Sprung will tell you, "the strength of these reports really comes if you create a list and don't report on all contacts." According to HubSpot, 74 percent of companies that weren't exceeding revenue goals didn't know their visitor, lead, MQL or sales opportunities. Understanding your funnel is critical to success. The only thing to remember here is that HubSpot workflows will only track to the goal list while the contact is actively enrolled in the workflow. So, if you're tracking between lifecycle stages with a longer sales cycle you'll want to add a step with a delay for however much time you think you need. The report will then give you both the sum of the recent deals for a given product and the average of recent deals for that product to give you an idea of revenue by product group and deal size. I hope that this helps spark some ideas that you can implement in your portal today. 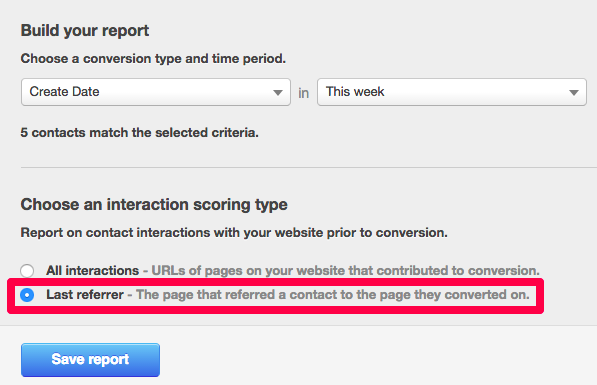 If there are other reports that you really like or ways you've hacked different reporting functionality together in HubSpot, I'd love to hear about it. Give a shout or leave a comment below! 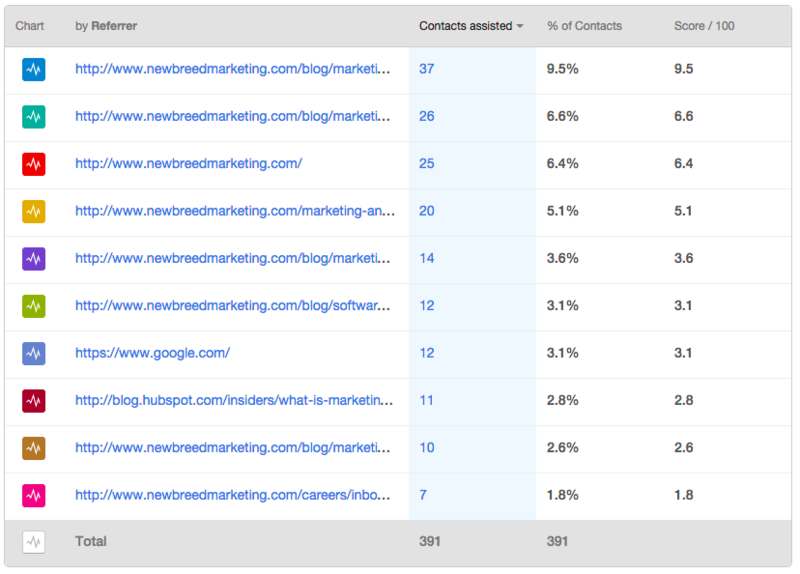 Thanks to Rachel Sprung of HubSpot for reviewing a draft of this post!